As much as I love the Vive and Rift, I often don't want to hold anything, not even well designed controllers, when I'm interacting with great VR. And I suspect for many people that's why VR gloves have held such a special appeal for the last 12 months or so. One French startup begs to differ. Go Touch VR is showing off prototypes of its VR Touch device at this week's VR World show at Kensington Olympia in London. CEO Eric Vezzoli's team of haptics researchers has stripped out the superfluous element - the gloves - and focused on the important part: the haptic feedback. I had a quick demo of how it works. 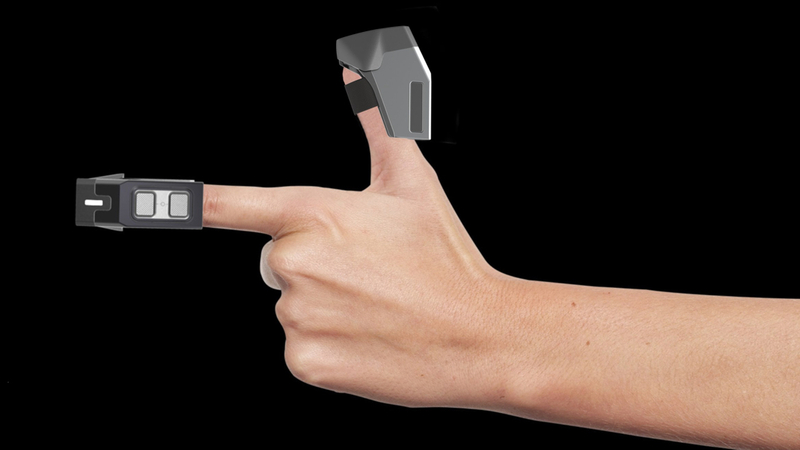 The VR Touch is a plastic cover for your finger that contains a small motor. It's modular so you can wear up to three VR Touch accessories on one hand, though I only got to try out one, which meant I didn't get to experience the sensation of 'grabbing' a virtual object. In a series of demos, I was encouraged to press a button, move my finger over a virtual fire and play a xylophone and mushroom drums. In each case, the sensation of pressing against something was really satisfying and the set up, which includes a Leap Motion strapped to the front of the actual VR headset, tracked each finger and produced the right level of feedback with impressive accuracy. The device actually contains an IMU - inertial measurement unit - for enhancing finger tracking too. It feels like a slight push back on the bottom of your finger, very different to a more general Xbox controller rumble or vibration. As I gradually moved my finger over the fire and back again, the sensation of force slowly increased and decreased accordingly. Now, this was less realistic than the feeling of my finger hitting a button or xylophone, but it's still simple and yet really pleasing when you're used to being inside VR and reaching out to touch... nothing. So why not a glove? "With a glove you need different sizes, you need to wash it, you have to wear it, you could have breathability issues in the summer," Vezzoli told us. "Also a glove you have to put it on, with this we are working to get to less than one second to get it on." It really is quick already to pop the device on with a band to secure your finger that attaches magnetically. VR Touch is wireless, connecting via Bluetooth and has a battery life of two hours, on the prototype I could see a microUSB port on one end. Right now, it's a 3D printed plastic prototype but Vezzoli is working to get 100 developer kits, also including software, ready for "professional users" by September. The startup says it is ready to work with Daydream, OSVR, HTC Vive and Oculus Rift plus it's not confining itself to VR, there's also AR applications. You can sign up now for the dev kit program & SDK - as well as the obvious cohort of developers looking for new feedback accessories for VR gamers, the big area for Go Touch VR is virtual reality training. The sensation of touch helps in the learning process. "Companies are telling us they've abandoned VR training because it just doesn't work," says Vezzoli. "People are learning the wrong actions using visual not haptics and it takes 50% longer to do an action if you don't have that feedback. But with this we can do professional training in industries like aerospace, automotive, professional healthcare and anything with big machinery and processes." It sounds wacky at first glance but there's a lot of potential here for such a simple and useful set up. After shipping the developer kit, Vezzoli plans to work towards an estimate of Q1 of 2019 for full scale manufacturing in China. He showed me a couple of prototypes, none of which are anywhere the size of design of a 'ring' as Go Touch VR's website suggests, but which will get more compact over the next 18 months. The other items on his to-do list: fundraising and more fundraising.